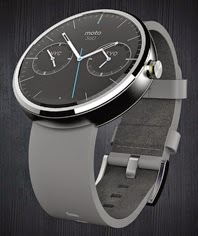 My darling wife recently bought me a Moto 360 smart watch because, well, because she’s an amazing woman. I gotta tell ya, I love this thing, and here’s why. I don’t have to worry whether I’ll hear the phone ring when it’s in my pocket, because the watch vibrates to alert me. I’m digging my phone out of my pocket less and less. After using it all day I’ve still got 40% percent battery life left. I can change watch faces as often as I feel like it. I’m currently using one that looks remarkably like a Rolex. Cooool. The band feels great on my wrist. When I’m navigating the watch vibrates when I’m supposed to turn, a safeguard in case I don’t hear the phone’s speaker. People ask about it and always think it’s cool. I can voice-text while driving, and my hands stay on the wheel. I can find out my heart rate anytime I want without taking my own pulse. I mean, seriously, what’s not to love?